MURRAY HILL, Manhattan (WABC) -- Police have made an arrest in a hit and run crash in Manhattan that left a woman critically injured. 63-year-old Robert Schuman was charged with leaving the scene of an accident and failure to yield to a pedestrian. Authorities say he was the driver of the van hit and critically injured a 60-year-old woman on Sunday morning in Murray Hill. In surveillance video, emergency vehicles are seen responding to East 38th and Tunnel Approach Street. 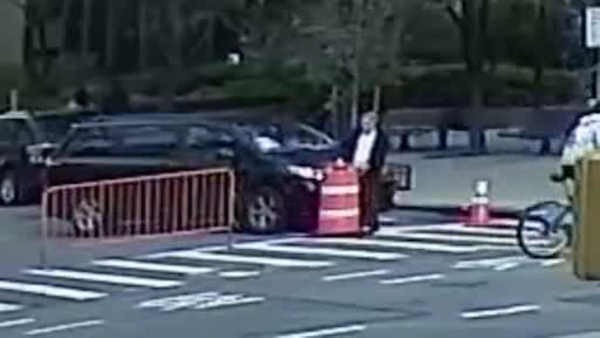 The NYPD released video of a suspect in a hit and run crash near the Queens Midtown Tunnel. The unidentified woman, who works as a live-in nanny on the 56th floor of the Corinthian, was alone crossing the intersection. As the van was heading east on 38th Street, making a right turn onto the feeder street to the tunnel, the driver hit the victim and kept going. The woman was dragged down the block.